Not long ago, I vowed to review every 8-inch Windows tablet. That's partly because they're popular, sure, but there was another reason, too: Their specs are so similar that you'd have to actually use one to know which is best. In a field full of same-y options, though, the Lenovo ThinkPad 8 would seem to stand out: It's the only one with a full HD screen, not to mention a 128GB storage option (good news for folks who'd rather not store stuff on a microSD card). Other bonus points include an aluminum casing -- a step above other tablet designs -- as well as optional 4G. Of course, premium doesn't come cheap; the ThinkPad 8 starts at $429, whereas competing models can be had for around $300. The question, then, is: Could it still be worth it? 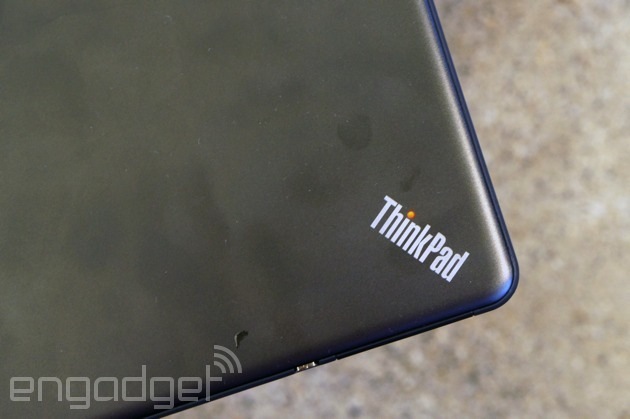 Be the first to review the ThinkPad 8? Chalk it up to the fact that I've spent a lot of time with this tablet, or maybe just blame the subjective nature of reviews. However you want to explain it, I'm less enamored with the ThinkPad 8 than my colleagues Mat Smith and Richard Lai were when they handled it back at CES. My theory: I've had more time to break it. OK, not break it, exactly; just scuff it up. After shoving the skinny tablet in my bag one too many times, I've managed to scratch both the aluminum back, as well as the Gorilla Glass screen, which should, in theory, be impervious to a simple set of house keys. And that's a shame: If it weren't for those durability issues, this would otherwise be a well-designed tablet. That metal casing makes it feel more premium than other 8-inch tablets, as does its especially slim shape. Indeed, at 0.35 inch thick and 0.89 pound, it's thinner and lighter than both the Toshiba Encore and Acer Iconia W4. 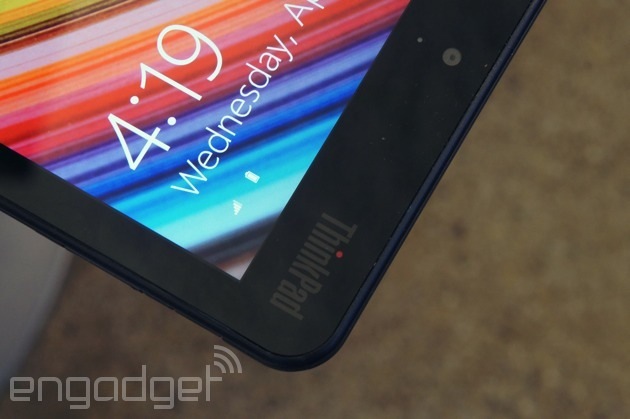 In terms of portability, the closest contender is the Dell Venue 8 Pro, which is just as thin, but weighs two-hundredths of a pound less (not that you'll notice). The downside to having such a skinny frame? Worst-in-class battery life. But hey now, let's not get ahead of ourselves here. More on that in a bit. For now, let's finish our tour of the device. Like pretty much every other 8-inch Windows tablet, the ThinkPad 8 was designed to be used in portrait mode. The giveaway: its button layout. Both the power button and volume rocker sit on the upper right-hand side, making them easy to reach when you're holding the thing vertically. Nearby, you'll also see a charging port, which works with a surprisingly big, chunky connector -- not the sort of thing you'd expect on a mobile device. The headphone jack, meanwhile, sits on the lower portrait edge, just where you'd expect to find it. As for everything else -- the micro-HDMI socket, the covered microSD port and SIM slot -- all that's tucked out of sight on the left side. Over on the front, there's a 2-megapixel webcam up top, with the standard Start key tucked into the lower bezel. Speaking of bezels, they're remarkably narrow, at least on the portrait ends, though they're still wide enough that my thumbs weren't covering the 8.3-inch screen (I have small hands, mind you -- those of you with hammier hands might have less luck). Around back, meanwhile, you'll find an 8-megapixel camera and accompanying LED flash, along with Lenovo's signature ThinkPad logo, with the "i" that glows red. There are also two small speaker grilles on the bottom of the back lid; they're so tiny, in fact, that I actually missed them on first glance. As small as they are, though, they deliver decent audio. Pharrell's "Happy," for instance, sounded quite pleasant, even if the volume didn't get very high. It's one of the main reasons to buy this, really: The ThinkPad 8 is the only 8-inch Windows tablet with a full HD, 1,920 x 1,200 display. And yes, the difference over regular 1,280 x 800 screens is actually pretty obvious. Even in modern Windows apps, where everything is bigger and more finger-friendly, on-screen objects look noticeably crisper. The same is even truer on the desktop, though that's perhaps not such a great thing. Items are harder than ever to hit with your finger, even the Windows Store icon that now comes pinned to the Taskbar in Windows 8.1. Obviously, if you're using any Windows tablet in desktop mode, you'll probably want a mouse anyway, but that's a little more of a hassle here, since there isn't an in-box dock or keyboard accessory. The occasional un-optimized app aside, it's a pretty good display. Even more than the crispness, I've enjoyed the viewing angles -- I only lose a little bit of color accuracy when I place the tablet face-up on a table to watch a movie. Also, thanks to the use of a direct-bonding manufacturing technique, the Gorilla Glass panel reflects relatively little light, so that even when I'm looking at the display from an off-angle, with harsh office lights overhead, I can still make out what's on the screen. As a trade-off, though, the display is on the dim side, so there's that to consider, especially if you think you might be using this outdoors. The only other potential caveat? It doesn't support pen input. 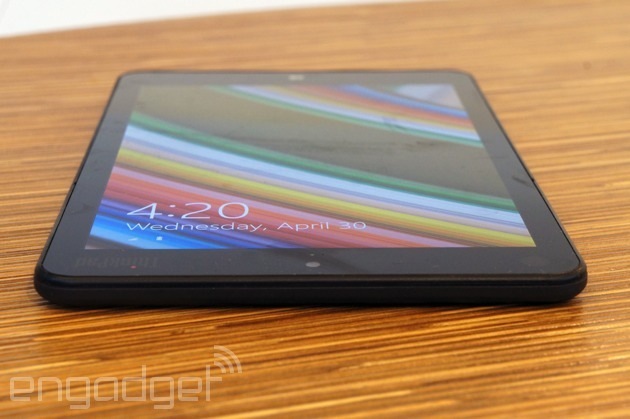 For that, you'll have to look at Lenovo's bigger ThinkPad Tablet 2 (or the rumored ThinkPad 10). Otherwise, you might want to consider Dell's Venue 8 Pro, one of the only 8-inch Windows tablets with an active pen digitizer. Even then, though, it's not our favorite tablet, for reasons I'll come back to a little later on. You've gotta hand it to Lenovo: The company mostly kept it clean here. All we have in the way of bloatware are Skitch Touch, Evernote Touch, Kindle, AccuWeather.com, Hightail (formerly YouSendIt), Zinio and the music-streaming service rara.com -- none of which are even that bad. Also on board: a trial of Norton Internet Security and a full version of Microsoft Office, which you'll find on every Windows tablet this size. Otherwise, there's not much say -- you can download the Windows 8.1 update, of course, but even that's geared mainly toward mouse-and-keyboard machines. For the most part, the ThinkPad 8 sticks to the script in terms of specs you'd expect to find on an 8-inch Windows tablet. That means: an Intel Atom processor, 2GB of RAM and flash storage (either 64GB or 128GB in this case). The main difference? The Z3770 chip here has a slightly higher clock speed: 1.46GHz, compared with the usual 1.33GHz. Indeed, that translates to the highest PCMark 7 score we've seen yet in a tablet this size. And for basic tablet tasks -- email, web surfing, Evernote -- that's just fine. As you probably know by now, though, specs don't tell the whole story and indeed, the faster clock speed doesn't yield any improvements in other tasks, like graphics benchmarks or gaming. In fact, though the ThinkPad 8 rules the PCMark test, it also turned in the slowest boot-up time: 14 seconds, compared with eight for the Acer Iconia W4 and nine for the Toshiba Encore. Also, though Intel hasn't published a TDP figure for this processor, I have to say: it gets quite hot during gaming (I mean, ouch). And then there's this: The battery life is short, even for a smaller tablet. At its best, the tablet can last up to eight hours -- that's according to Lenovo's official marketing materials, anyway. In practice, though, we only got six hours and change after looping a video at half-brightness. Meanwhile, the Dell Venue 8 Pro lasted seven hours and 19 minutes in the same test, while the Acer Iconia W4 managed nearly 10. If longevity is a priority (and why wouldn't it be? ), you might want to look elsewhere. The ThinkPad 8 comes in two different flavors: 64GB and 128GB (good luck finding 128GB on any other 8-inch Windows tablet). Prices start at $429, and go up to $569 on the beefier model. Adding 4G will, of course, boost the price even higher. If we haven't sold you regardless, there's thankfully a multitude of alternatives, including a bunch with equally compact, 8-inch screens. At the moment, our favorite is the Acer Iconia W4 ($300-plus), which we gave a pretty good score of 83 thanks to its long battery life, solid performance and much-improved display. It's not perfect, but if you're set on an 8-inch Windows tablet, this is by far your best bet. After that, the scores fall way down into the low 70s, which means we're recommending these other products, but with faint praise. The Dell Venue 8 Pro ($250-plus), for instance, has an awkwardly placed physical Start button, instead of a touch-sensitive key somewhere on the bezel. On the plus side, it's one of the only 8-inch Windows tablets we know of to support pen input (there's also the ASUS VivoTab Note 8, which we haven't reviewed). But, on the downside, the pen digitizer on the Venue 8 Pro was unreliable when we tested it. (Note: This may be less of an issue now, thanks to subsequent firmware updates, but buyer beware nonetheless.) Meanwhile, the Toshiba Encore ($300-plus) offers only one real advantage over the competition, which is that it has a micro-HDMI port for outputting video. Even then, the ThinkPad 8 happens to have that too. Overall, then, it's an okay tablet; there's just little reason to choose it over the others. The ThinkPad 8 is indeed a stand-out tablet, but not necessarily for the reasons you think. It has the winningest specs, and yet it should also be the first one you cross off your shopping list. On the one hand, it has a sharp 1,920 x 1,200 screen and up to 128 gigs of storage, but it's also more expensive than any other 8-inch Windows slate, with worst-in-class battery life to match. For the money, it doesn't bring extra features, either -- no pen input, no fingerprint reader, no state-of-the-art camera. Realistically, I'd probably be more charitable if it was priced in line with other 8-inch tablets, but even then, it wouldn't be a slam dunk -- not with that tiny battery, anyway. Truth be told, none of the small-screened Windows tabs we've reviewed are perfect, but they all manage to offer a little more value.